My boyfriend and I had a chili cook-off to attend on Saturday. So while he was busy making his chili, I was busy whipping up these cookies. His kitchen was a hotbed of activity and yumminess. I really enjoyed baking the bacon for this recipe. Yes. BAKING the bacon. Brushing maple syrup over bacon strips that were arranged on a wire rack on top of a cookie sheet was weirdly theruputic. It took longer for the bacon to cook in the oven than the recipe said, but after 35 minutes, it was perfect. 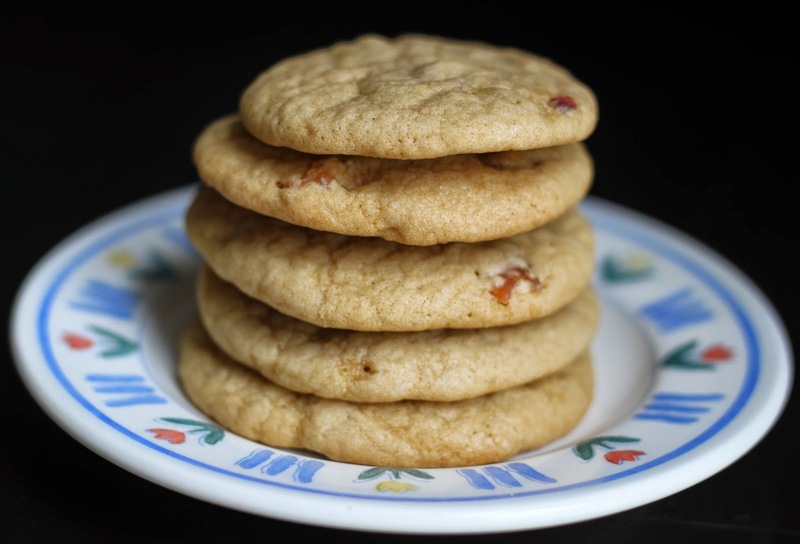 The dough of the cookie is very sweet with all the maple syrup and brown sugar that was called for, but the addition of salty bacon complimented it so well. It's like pancakes and bacon made love and birthed this cookie. People at the chili cook-off said the cookies were delicious and that they wished they had a cup of coffee to go with it. It has snowed twice since last week's blizzard. It's actually currently snowing in NYC. Winter has definitely decided to stay around. However, I didn't get a snow day from work. No snow day from work = no time to bake. Fear not! I still have something to post! I made these rolls last week during the blizzard along with the Chocolate Chip Cookie Brownies. My kitchen was THE PLACE TO BE during winter storm Juno. Just saying. I was excited about these rolls because I love popovers. Also, I was nervous about using yeast. Isn't that silly? I've used yeast many times before and have baked lovely baked goods with yeast and yet I'm always nervous about using it. Probably because yeast is so finicky. This recipe yielded more of a dinner roll than a popover. When I hear "popover" I think of something airy and eggy. This recipe yielded just a normal dinner roll with the added benefits of nutmeg, orange, cinnamon, and sugar flavors. If you're intrigued by the combo or want a twist on the normal dinner roll, by all means feel free to try your hand at this roll. But if you want something more extraordinary, you can skip making this recipe. When people in NYC hear of an impending blizzard, they rush to the store and buy wine and food such as meat, cheese, bread, and veggies to sustain them for a couple of days. I rush to the store and buy wine and chocolate chips. A big blizzard was predicted to hit NYC last night and this morning. You can read all about it elsewhere. In preparation for being stuck inside due to snow, I decided to make this Chocolate Chip Cookie Brownie recipe. It's been in my "recipes to make" folder for almost two years! I've been avoiding super sugary and dense recipes recently, but something about the middle of winter and snow had me craving both these characteristics. 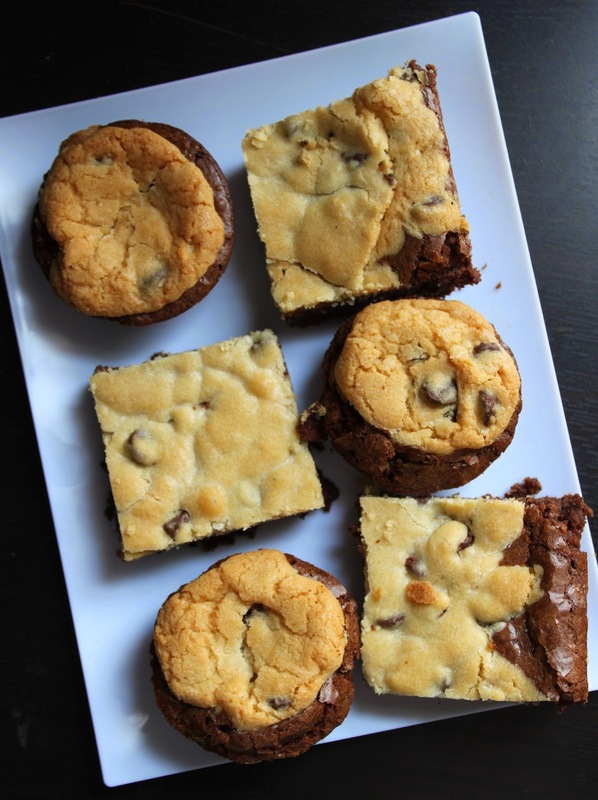 The blog that posted this recipe had problems with the cookie dough sinking to the middle of the brownies. So I looked for other options. I decided to do half pan, half muffin pan to see which worked the best. If you like gooier brownie, go with the 4x4. If you like a more solid brownie, go with the muffin pans. Either way, this recipe is sure to please the brownie and cookie lover in your life! I used my favorite Supernatural Brownie Recipe for the brownies and I used A Pinch of Yum's suggested cookie recipe. I got the muffin pan idea from Very Best Baking by Nestle. I've finally been getting around to my "Recipes to Make" Pinterest board. These Gooey Butter Cookies always caught my eye while visiting my Pinterest boards. Their bright and cheerful yellow color piqued my interest. Guess what! You just have to use a yellow cake mix to get the yellow color. This past weekend my roommate had the urge to bake. He had a big bag of apples that he needed to use so he decided to make a crispy/flaky apple pie. 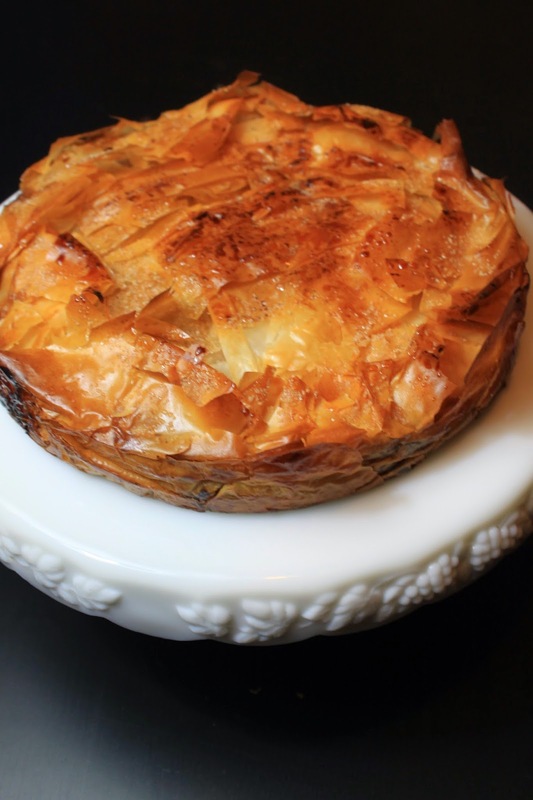 He layered the phyllo dough along with a bunch of melted butter in my spring form pan since I didn't have a tart pan. Even though the butter flowed onto the bottom of the oven and created a smoky apartment for a little bit, this tart turned out beautifully. 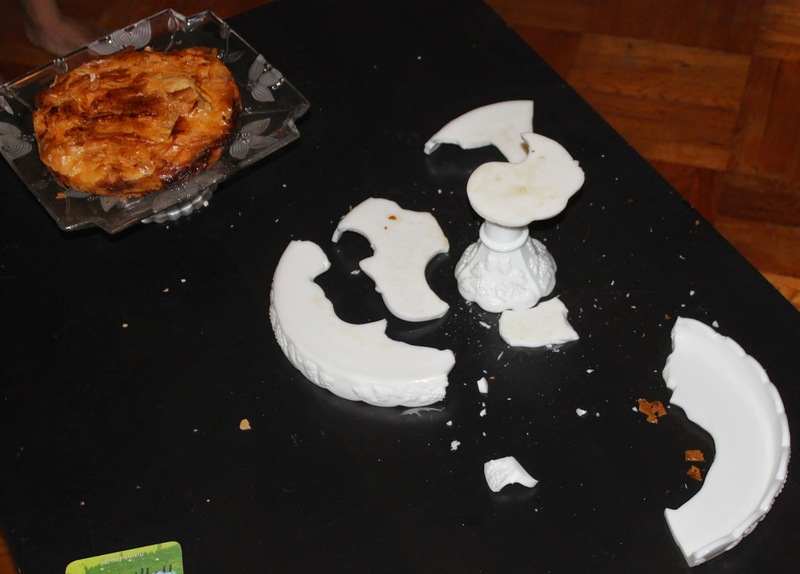 My roomie asked if he could put his pie on one of my cake stands and I said yes. It looked so pretty on my sturdy, white ceramic cake stand that I just had to snap some photos. After I was done, he went to the kitchen to clean up and I went to my room to get ready to head out for the evening. Then we heard a pop. We couldn't figure out what it was at first but then my roomie saw that the cake stand had two cracks in it. I went over to touch the stand and *CLINK* *CLUNK* *WHAM*! The whole stand started crumbling in front of our eyes. My roommate ran to get another cake stand but it was going to be too late so I did what any baker would do: I put both of my hands under the pie so the masterpiece wouldn't join the ranks of the broken cake stand. I moved it via my hands to another cake stand and then we just looked at the broken cake stand in bewilderment. The pie had cooled before it went on the ceramic, but we're guessing the heat that was left bugged some weak spot and *POP*!